New peer-reviewed article recently published in March 2010. This article was published in the Indian Journal of Dermatology, an unbiased peer reviewed, indexed journal. It is not easy getting published in a scientific journal of this caliber. The work has been subject to rigorous examination for years before it finally gets published. As a matter of fact, this article was first submitted back in 2008. It didn’t get officially published till now. We were told that it is a hundred times easier to get published in the journal of ISHRS then in any of the indexed peer reviewed journals. Re-print with permission from Dr. Arvind Poswal. Introduction: The use of body donor hair for transplanting to the bald scalp is termed body hair transplant. In recent times, robust body hair has been used as an adjunct to scalp donor hair to augment the donor hair supply. A large percentage of body hair are in telogen and, as single hair units. Aims: To devise a non invasive protocol to identify the body donor hair in anagen phase prior to extraction. Materials and Methods: Hairs are shaved flush with the skin, four days prior to extraction. On fourth day, the actively growing hair follicles as well as non growing hairs were extracted and phase of hair growth determined. Results: Nineteen out 22 extracted hair follicles in nongrowing phase were found to be the telogen phase. Conclusion: Preshaving the body donor areas is a simple non invasive method of isolating the hair in anagen phase. 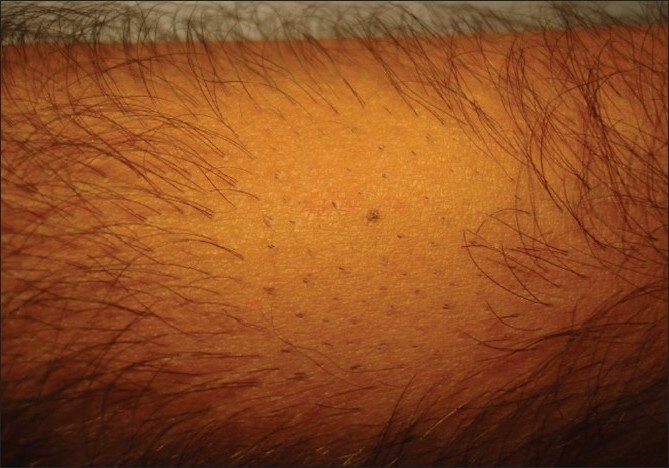 A higher percentage of body hair grows as single hair follicular units. A high percentage (40 to70%) of the body hair is in resting telogen phase (not exogen) at any particular time. The dermal components of the hair (the dermal papilla) are attenuated during telogen, and more prone to damage during individual follicular extraction. 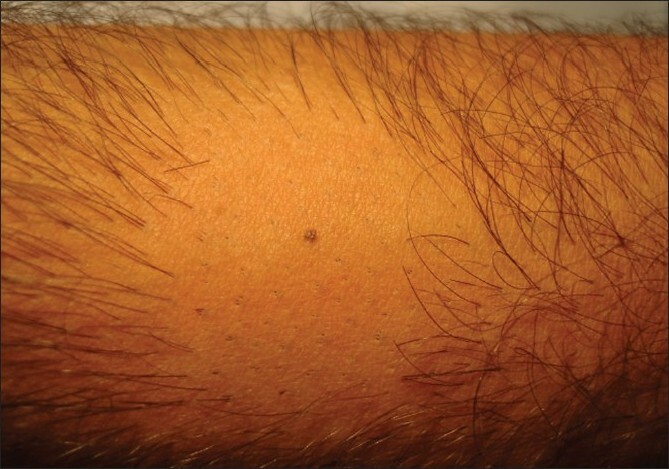 Therefore, only body donor hair follicles in the active anagen phase are preferred for transplant. Since all the telogen hair do not shed, and may be visible in the body donor area, it is necessary to employ a non invasive method to identify the hair in anagen phase, before extraction. The preshaving protocol is a simple, non invasive way to identify body donor hair in anagen phase. The patient shaves the body donor hair with a razor. The hairs are shaved flush with the skin, four days prior to extraction. At the end of three to four days, the actively growing hair is easy to identify due to their increased length. 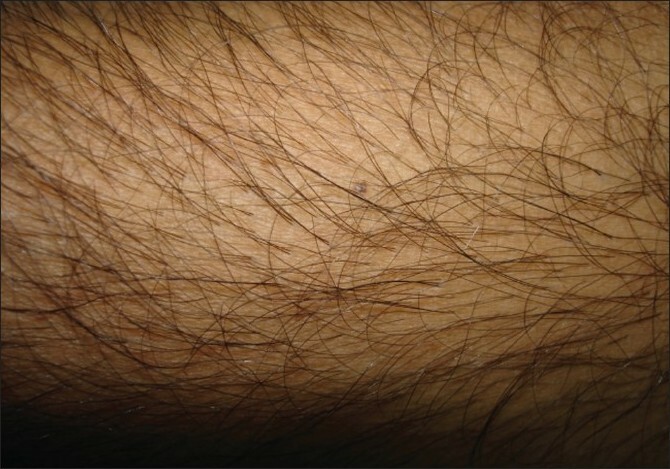 The accompanying picture sequence illustrates this method - [Picture 1] is taken before any shaving or trimming of the hair on the forearm. The mole is the reference point in all the pictures. [Picture 2] shows the area with the hair trimmed to 1 to 2 mm. At this length, it is not feasible to distinguish the hair in anagen from those in telogen. [Picture 3] shows the area immediately after wet shaving flush to the skin surface, [Picture 4] and [Picture 5] show the same area, one and four days after shaving. As can be seen in [Picture 6], showing comparison, there are more visible, long hair after just trimming compared to four days after shaving. (2) The effect of transplanted body hair growth cycles-40 to 70% of the body hair are in telogen at any particular time. In addition, their duration of anagen is much shorter (12 to 16 weeks) as compared to the scalp donor hair (2 to 5 years). 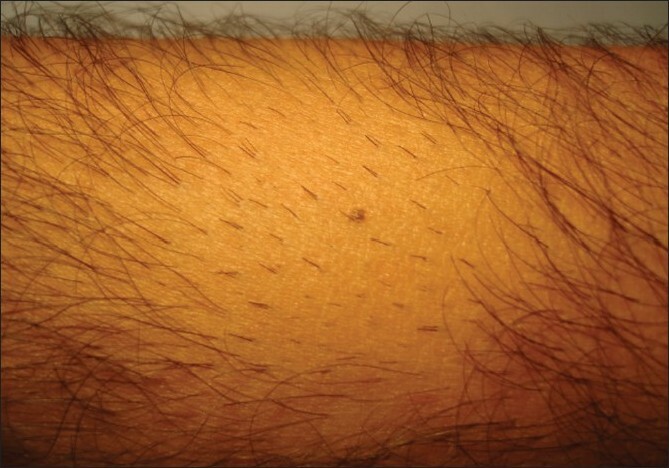 Preshaving pinpoints body donor hair whose growth cycles are more closely synchronized. 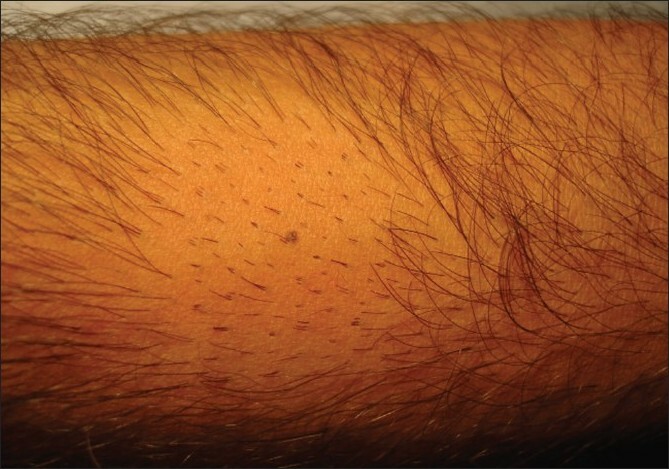 Transplanting these hair results in a closer synchronization of the growth and shedding phase of the transplanted body hair in the initial growth cycles. However, over a two year period, as the hair go through repeated growth cycles, the growth phase of these transplanted body hair lose their synchronicity. Compared to the scalp donor hair, large percentage of body hair are in telogen at any given time. Preshaving the body donor hair three to four days prior to extraction is an easy way to identify hair in anagen phase that can then be used for transplanting. Or open the attached PDF file provided by Dr. Arvind Poswal. Great article, it’s amazing how nobody ever thought about this till now. Brilliant, why does it apply to body hair only? You can easily do the same for head donor, there is no reason why the same cannot be done for head donor site. » journal of ISHRS then in any of the indexed peer reviewed journals. » Re-print with permission from Dr. Arvind Poswal. » hair in anagen phase prior to extraction. » nongrowing phase were found to be the telogen phase. » invasive method of isolating the hair in anagen phase. » phase (not exogen) at any particular time. » invasive method to identify the hair in anagen phase, before extraction. » donor hair in anagen phase. » hair after just trimming compared to four days after shaving. » scalp donor hair (2 to 5 years). » hair lose their synchronicity. » that can then be used for transplanting. » Or open the attached PDF file provided by Dr. Arvind Poswal. How practical is this? You have to ask the patient to show up on day 1, get shaved, wait a few days in a hotel and then come back again to examine which follicles are in anagen phase and good enough for hair transplant. I suspect many people are from out of town so even though this protocol makes a lot of sense, it is simply impractical to ask every patient to follow the protocol. We introduced the preshaving protocol, for body hair harvesting, for the first time in 2004. It was documented on hairsite. There is a big difference in growth cycles of the body v/s scalp donor hair. %age of hair in anagen (over 85% of scalp hair are in anagen at any one time whereas 10 to 50% of hair are in anagen in different body donor areas). Body donor area follicular units have more 1 hair groupings compared to the scalp donor area. These are some reasons why the preshaving protocol makes more sense for the body donor areas. It is actually very practical. Think of preshaving as “getting rid of the hair that are in telogen”. The patient shaves the proposed body donor areas 3 to 4 days before he is scheduled for his HT. When he comes for his procedure, the actively growing body donor hair will be identifiable for extraction. Its as simple as that. Doh! you shaved before you visit the clinic, are you telling me you don’t know how to shave your arms and you need a doctor to do that for you? » » which follicles are in anagen phase and good enough for hair transplant. » know how to shave your arms and you need a doctor to do that for you? Dr Arvind what is the worst that can happen if the doctor selected a donor that is in telogen phase? My guess is that the hair will still grow, it’s just going to take a bit longer, it’s not like he loses the graft forever because the doctor picked a telogen donor. » because the doctor picked a telogen donor. Following carefully conducted trials, we have found that transplated body hair will, at best, give rise to wispy hair growth (akin to transplanting hair follicle transected at the bulge level located slightly below the sebaceous gland). » approved in a REAL medical journal. That is why it is significant that the indexed, peer reviewed journal “Indian Journal of Dermatology” reviewed, vetted and published it. One has to understand the difference between REAL peer reviewed medical journals and sundry publications and I am glad you pointed this significance out for the layman to understand. Thanks. I know we are justifiably proud to have our doctor’s research validated by mainstream medicine. » » approved in a REAL medical journal. » I agree with you. » “Indian Journal of Dermatology” reviewed, vetted and published it. » significance out for the layman to understand. Thanks. must we believe with Doctor analys?? can i get more explanation about it? Where is mj2003’s post? What did he say (full text/quote)?